Trixie Midi-Capri Pet Carrier | Free P&P £29+ at zooplus! Easy to Use :"This is the best small pet carrier I have ever used. Ideal for the vet trips as the vet can access your pet easily and you can load them easily without distressing them. 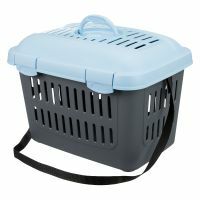 Plastic box helps prevent spil"
The Trixie Midi-Capri Pet Carrier is ideal for taking your pet to the vets, as it opens from the top to allow you to place your pet inside without any stress or hassle. Ventilation slits ensure that the Trixie Midi-Capri Pet Carrier has optimum circulation, with a handle and shoulder strap for comfortable carrying. Journeys can be stressful for your pet, so offering a transport carrier that is comfortable and easy to get in and out of is a must. The Trixie Midi-Capri Pet Carrier has a lid that can easily be opened and closed, making it possible to put your pet into the carrier from the top and being a real bonus for the vet! It helps to protect both you and the vet from injury, as well as being a more pleasant experience for your pet. The Trixie Midi-Capri Pet Carrier is made from robust, stable plastic that is easy to care for. On the side and in the lid there are ventilation holes that help to ensure the air can circulate properly inside. The transport box is suitable for cats, dogs and small pets weighing up to 5kg. The integrated carry handle and included carry strap make it easy and comfortable for you to carry the box around. Note: You will need to introduce your pet to the carrier slowly and carefully. Start by leaving the door open and allowing your pet to slowly enter in of its own accord. Then start closing the door and leaving it closed for longer and longer periods of time. Then try taking the pet carrier for a short spin in the car. The carrier should never be used as a punishment but rather be seen by your pet as a safe, positive place. very poor quality, to the point it's dangerous. The clips are plastic that you have to *bend* in order to do up and close carrier. Repeated bending of hard plastic leads to snapping- one clip broke after one use! I was too scared to continue using. If another broke while box was in use it would fall open and animals would escape- danger of injury or losing them. Recommend no one buys this. I'm very disappointed with this product :( It looks great on pictures, but the quality is awful. The plastic is so weak it at the latches it looks like I can tear them apart with my hands if I'd want. I bought it to take my cat to the vet, but won't even risk to try as this carrier is clearly not safe for cats. It's a shame. Prompt delivery ,fantastic value .really pleased with this item.recommended. We purchased this as we needed an extra cat carrier desperately due to several poorly cats. It is amazing. This box is brilliant. It comes with the lid off but it is very easy to put on and the cat is so secure it's brilliant honestly. It's cracking little bargain from Zooplus again. Don't miss out. It would easily fit a small dog in it, we have a good size cat in it easily. Milo was very happy he lots of room to move about and he was lying down most of the time very happy. The only thing I will say is that the slats are very thin so you can't really console the animal. Have had this for ages and well worth the money. I use it for trips to the vet or for a short stop while cleaning out my guinea pigs homes. Only downside is you can't fix a bottle to the side as it has also been used as a hospital area. I am just ordering a second one but the first is still well in use. I bought this carrier for my guinea pigs and it's by far the best carrier I've ever come across. It's so much easier to lift them in and out with the large top opening and it means a lot less stress for both me and the piggies. It's also big enough for two adult guinea pigs so they can keep each other company on the way to the vet. Just throw in some snuggly fleece and they're totally comfortable! 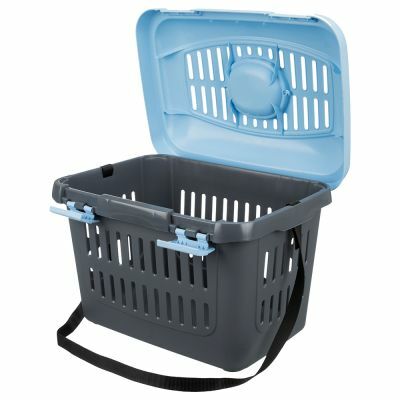 This type of carrier is more suitable for very small animals like guinea pigs, rabbits etc. The latches on the top are moulded plastic and become loose with use. The weight of a cat inside makes makes them open and the bottom part swings open and the cat escapes. There is no additional safety measure to ensure this doesn't happen. Also, it is very small for an adult cat. There is insufficient room to turn around or avoid sitting in any "accident" the cat may have in the carrier. If your cat is reluctant to walk into a carrier, there are very good models for about $25 with both a wire mesh front door and top loading sliding doors as well. Much safer and more comfortable for your cat. I couldn't imagine anyone using a carrier this small for a dog, even the most miniature of dogs. It would be cruel. This carrier is soooo much easier to use than the usual front-loader, where you're trying to fit 4 reluctant limbs through a small gap. Much less traumatic for both me and my cat - excellent product. I have just bought my second one of these as I have 2 cats - it's fine for 2 kittens but not really big enough for 2 adult cats. The top opening makes it very easy to get the cat in. The shoulder strap is likely to work loose, so should be checked every outing but the carry handle is more than adequate - overall a good buy! Easy to get cat in and out of, I am now buying another one as I have two cats which are now too big for one box! The shoulder strap isn't all that, but the carry handle is quite sufficient.